THE STORY - Scott Lang is grappling with the consequences of his choices as both a superhero and a father. Approached by Hope van Dyne and Dr. Hank Pym, Lang must once again don the Ant-Man suit and fight alongside the Wasp. The urgent mission soon leads to secret revelations from the past as the dynamic duo finds itself in an epic battle against a powerful new enemy. ​​In a summer of sequels that have ranged from underwhelming (“Sicario: Day Of The Soldado”) to painfully embarrassing (“Solo: A Star Wars Story”), “Ant-Man And The Wasp” succeeds largely by sticking to the basics. It doesn’t aspire to reinvent the wheel or shake things up narratively, but rather it uses the pre-existing wheel to take audiences on a ride through the sillier parts of the Marvel Cinematic Universe. The result is a film that, while openly formulaic, is ultimately sharper and more confident than its predecessor. The film begins with hacker-turned-hero Scott Lang (Paul Rudd) under house arrest, seemingly one of the only Avengers who paid for the events of “Captain America: Civil War.” A working knowledge of that film is helpful, but as is the case with most MCU entries, not required. 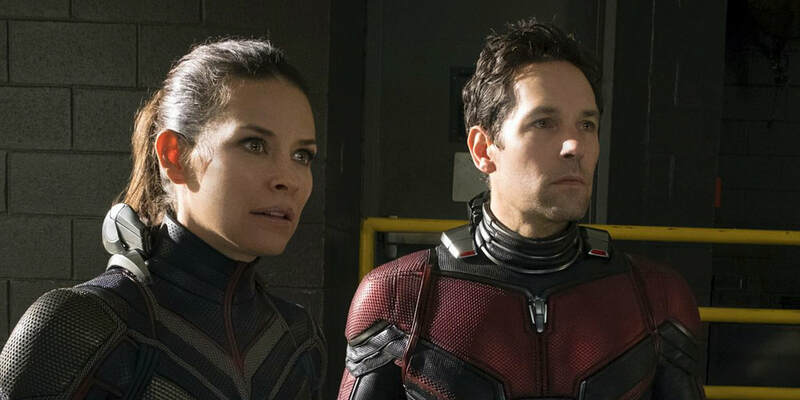 Lang’s actions have estranged him from his genius mentor Hank Pym (Michael Douglas) and Pym’s daughter Hope Van Dyne (Evangeline Lilly), though they’re forced to come together when they’re faced with mysterious new foe Ghost (Hannah John-Kamen) and the possibility of saving Pym’s wife Janet (Michelle Pfeiffer) from the quantum realm, where she disappeared thirty years earlier. The ways in which these subplots unfold are rote and predictable, right down to the romantic interplay between Lang and Van Dyne and the obligatory “tragic” villain. There are no subverted expectations nor surprise twists; the manner in which you predict the film will play out is exactly how it plays out. This may be a damning assessment for some, particularly those who already see the MCU as a generic assembly line, but director Peyton Reed and his stable of screenwriters (Including Rudd) are smart enough to recognize their strengths and cater to them. They fashion “Ant-Man And The Wasp” as a comedy in superhero drag, and like any good comedy, the devil is gleefully hidden in the details. It’s the little things that count here, which is especially fitting for a hero that can shrink to the size of an ant. The film’s high points coincide with the instances where its characters go off on narrative tangents or poke fun at the fact that their quest can sometimes be needlessly complicated. After a dense exchange between Pym and a former colleague/current rival (Laurence Fishburne), Lang asks whether they just stick “quantum” in front of scientific terms to explain their powers. When Lang’s buddy Luis (Michael Pena) is taken captive and threatened with an injection to make him talk, he asks whether they’re referring to “truth serum,” and the overly-serious henchman realize how silly their methods are. Luis then spills the details on everything from his love of Morrissey (“We relate to his melancholy ballads.”) to his hatred of how Lang fills the dishwasher (“Who puts a plate on the top rack? !”), in a scene that perfectly sums up the film’s irreverent charm. It’s a credit to the versatility of the cast that these episodic tangents can be stitched in with dramatic moments and still form into something cohesive. Rudd is one of the most likable comedy actors working today and his performance as a superhero who has to contend with raising a daughter and struggling to find work as an ex-con provides an earnestness that other MCU films lack. He is the Avenger we can all relate to. Lilly is ideal as the skeptical foil, and seeing her transition from love interest in “Ant-Man” to crime-fighting partner here is easily the film’s most satisfying arc. The transition enhances both our love for the character and our desire to see her take down henchman in future installments. That the film is able to add her to the mix without diminishing or dumbing Lang down is a fear I had going into the film that is thankfully unrealized. Theirs is a genuine partnership; one that sets them up as a unique and welcome addition to the larger MCU. Coming off the epic scale and scorched intensity of “Avengers: Infinity War,” “Ant-Man And The Wasp” is a wisely placed and effective palate cleanser. It is a charming, entertaining adventure that doubles down on what made the original a hit without losing sight of its light spontaneity. The acting is fun, and the action scenes are comically inventive. Will it stand up as one of the MCU’s finest achievements? Certainly not, but when a filler release is as polished and well-executed as this, there’s not much else to complain about.